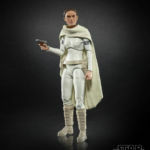 The Toyark › Star Wars Toy News › Star Wars Black Series Ep II Padme Revealed at Paris Comic Con! 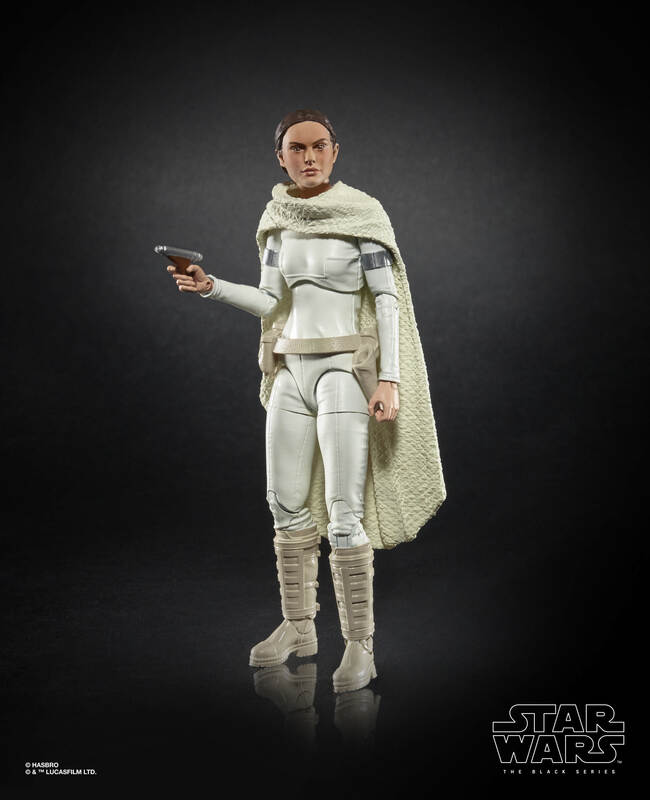 Star Wars Black Series Ep II Padme Revealed at Paris Comic Con! Hasbro’s Paris Comic Con joint panel with Marvel, Transformers and Star Wars is over and official pics are starting to drop! 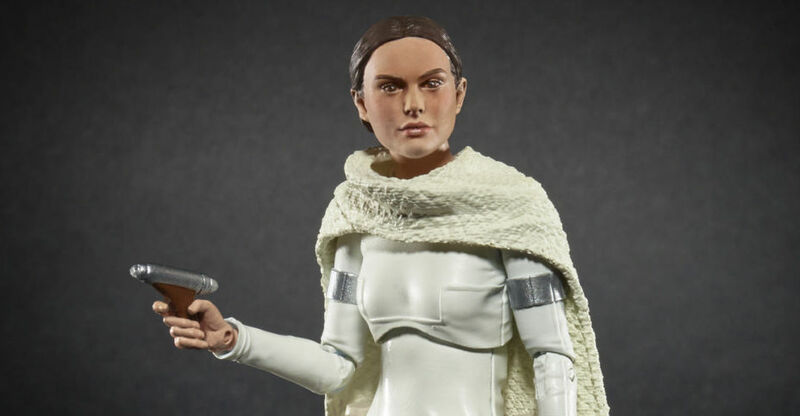 The big reveal for Star Wars is that an AOTC Padme in Geonosis gear is inbound from Star Wars Black Series. 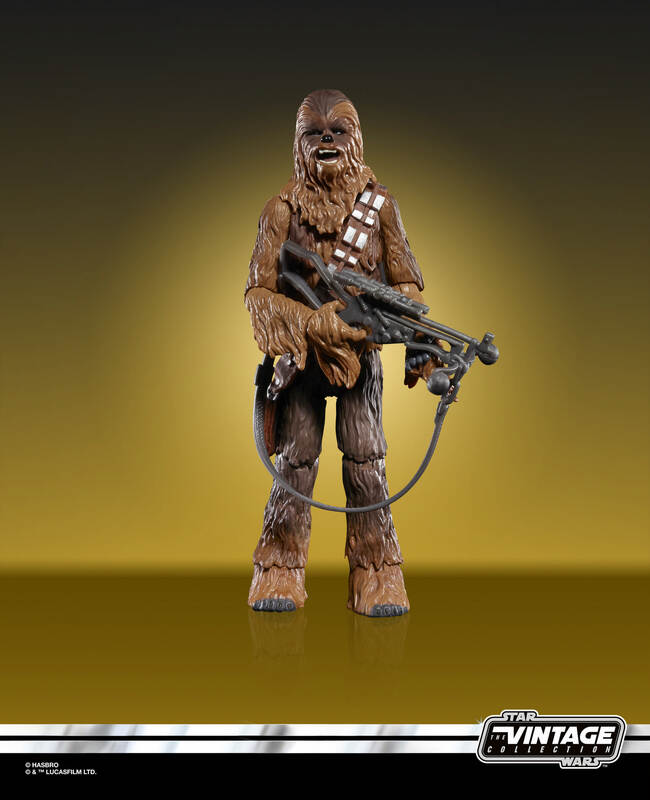 In addition, Vintage Collection Chewbacca was also shown. Both are due in Spring 2019. Read on to check the official pics! There are actually some pretty good reveals in these. I think the Spiderman bare arms odd. I don't really like the look of it. Concept is cool though. The Goblin looks pretty good too, Hopefully that comes with the flying piece.Wilson Fisk head without a mouth? Hasbro revealed a couple of figures at their panel. Marvel Legends will be getting Grey Gargoyle and a classic comic book Loki. Star Wars Black Series will be getting an Ep. 2 Padme in her white outfit (non-ripped version). 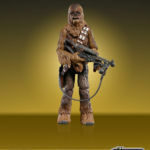 Star Wars Vintage will get a new Chewie. He looks like an Ep. 4 version. Not for nothing but, the fans have made six arms spidermans and kept the torso articulation, so how come the company cant just do the same?Is literally drill 4 holes into the pizza spidey mold. Surely a Sleep Walker figure HAS to come out eventually? I'm a little bummed. 6-arm Spidey is one of my favorites but oooph I look at the torso and I think its from the kids/budget line. Everything but the torso actually looks like reuse from the Amazing Spider-man 2 Spidey with the sculpted in webs. Aesthetic choice that's more to taste than anything else. Considering Spiral, another I really want a rerelease/new version of, has less figure to get the 6 arms on and still has a diaphragm joint. I know the arms have to come out from the abs, but I really hope they can engineer an ab crunch in there. I won't argue for butterflies though. Side note, Black Cat's shins could get used for Spiral. Just saying Hasbro. Its right there. I was hoping Loki would be on a bigger buck but honestly I don't know what I was expecting. Grim Reaper body is probably as good as they could do, but Hyperion would be too big. I'm probably just like the old one too much. Gray Gargoyle looks pretty good. Excited for Puma. Loki is also looking nice. That padme head is horrible hopefully not the finshed product. Six arm spider-man has an odd texture to him. Looks like the webbing is sculpted in. Hopefully the existence of this mold leads to a Doppleganger. I imagine it will be like the IW Black Widow: TERRIBLE prototype, fantastic retail release. Yeah, I don't know what's up with Hasbro using that for the promo image when it looks as if the actual head sculpt is really good (there's pics floating around of the figure on display at the con). She's got this sort of Jack Black thing going on. I hadn't even thought of a Doppelganger. That and a Man-Spider are high wants after Six-arm. Also the articulation is kinda similar to the old SM Classics man-spider. oh and just that guy called BEAST !!! 6" Battle Droid at last. Watch this once mocked army builder blow up on the aftermarket (depending on how much its wave saturates). I think they'll be popular since it's the first separatist trooper at this scale. As long as it can get a two hand pose on its gun. If it can't, then that's sad. R2-D2, dagobah I guess. Why can't they articulate that middle foot/leg? My favorite thing from Star Wars, one of the few Figuarts I bought before I actually cared to collect them, is finally here! I've got high hopes for the Battle Droid. Will definitely be buying a few. Hopefully he can bend into travel mode (?) After how good K2SO turned out, I'm expecting this'll be a home run. THAT BEAST THOUGH. I'm really excited for the articulation, I love a good toe joint. Looks like he has DC Icons torso articulation, diaphragm ball and waist-crunch, but geeze did they pack it in on a big body. Hope that's the Hyperion replacement with fur on top. I'd be down with a smooth version of that for Venom or the Omega Red, wonder how big he'll be overall. Glad they seem to be putting butterfly joints in everything now. Also, I'm weirdly happy to be getting a revolver with Union Jack. Big ups to Hasbro firing on all cylinders these days. Wow, great timing with all of the cons happening at once. Lots to love from all of the reveals!! Gonna need to pour over all of the pics, now. Finally Beast Sweet, after all these yrs of waiting and thinking that I would have to settle for the Diamond Select version. OMG. So much cool reveals at London and they saved the Beast for last. That Beast figure makes my heart swell. So freakin cool.